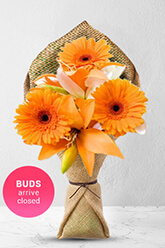 This delightfully radiant and friendly bouquet consisting of yellow Asiatic Lilies and 3 orange Gerberas will brighten even the dullest of days. You can count on it to bring a beaming smile or even a grin to anyone’s face.Lilies may be sent closed/partially closed in order to prevent damage and to last longer.Vase not included, but to personalise your gift, you can order a vase to be sent with your order. We recommend a standard vase to accompany Breena. Efficient and helpful when I missed some of the address! Very easy ordering system, literally took minutes once the I decided on the arrangement I wanted to send, and the order was delivered same day as promised. The recipient was extremely satisfied! No hassles, delivery on time, happy recipient.